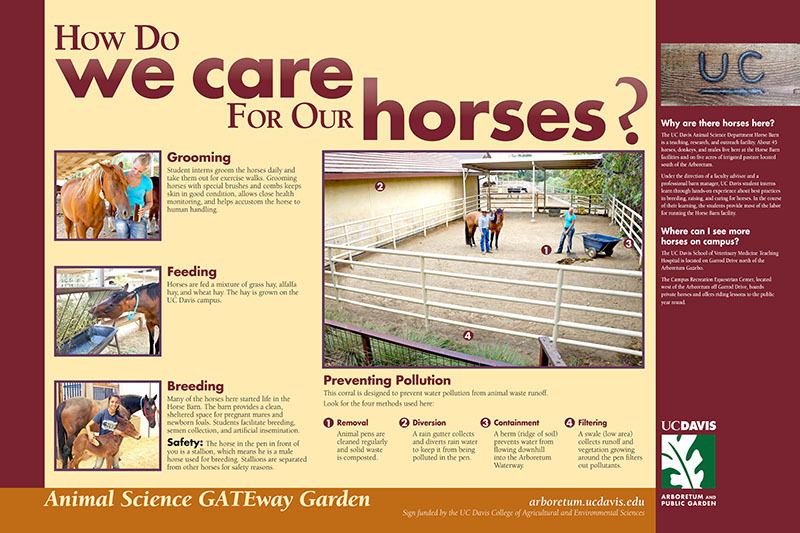 The Animal Science GATEway Garden gives visitors an opportunity to get closer to some of the animals that live on campus, learn about the world renown expertise of the UC Davis Animal Science Department and find out more about animal agriculture. Visitors can find this lovely and inviting space just north of the Arboretum’s Southwest U.S.A./Mexican collection where pathways lead directly to a welcoming visitor gate lined with steel animal silhouettes that flank the University of California’s heritage livestock brand. Beyond the gate, guests are welcomed to linger at the horse viewing area, take respite in a variety of shady seating areas, and learn from a series of interpretive signs. The deck is constructed from the redwood planks of campus-grown trees that needed to be removed for health or safety reasons. There is a seating area here designed from re-purposed squeeze chute and another from upcycled tractor seats. 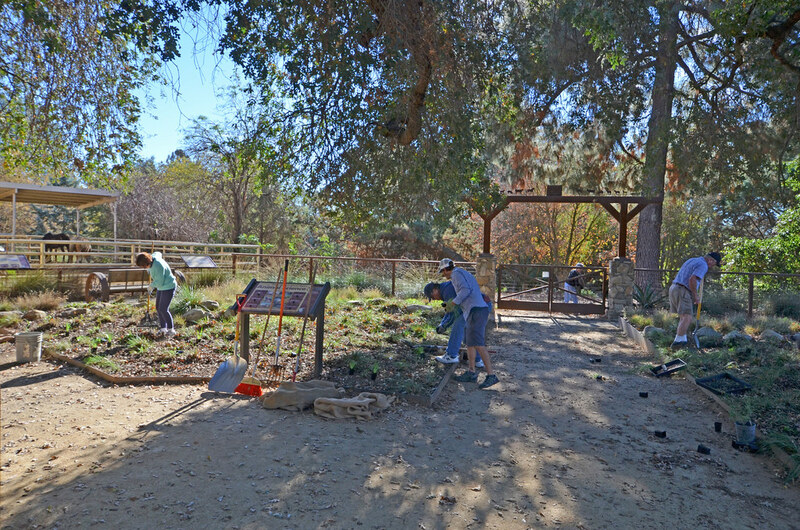 The garden was designed by a landscape architecture student and intern in the Arboretum and Public Garden’s Learning by Leading Program, John Gainey, who, along with Animal Science’s farm crew, UC Davis Arboretum and Public Garden staff, and a collection of volunteers across our campus and community, completed the project in spring 2015. UC Davis Animal Science GATEway Garden is the result of a collaboration between the College of Agriculture and Environmental Sciences and the UC Davis Arboretum and Public Garden.